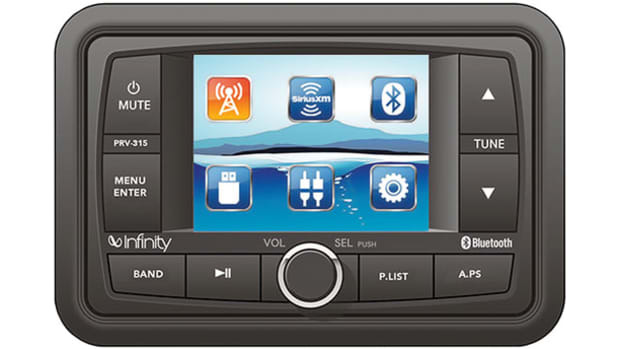 One of the layout possibilities with Fusion&apos;s four-zone head units, wired remotes, amps, and speakers. You get the same volume and source controls at each of four possible wired remotes, minus the graphics, or you can set a remote to simply control the volume/mute of the zone it&apos;s in. You can also set volume limits for individual zones to protect smaller speakers, as well as high- and low-pass filters to tailor the sound to whatever speakers the zone uses. You don&apos;t need to use Fusion speakers or auxiliary amps—most any brand will integrate—but the company did exercise its boaty and innovative ways in these departments too. 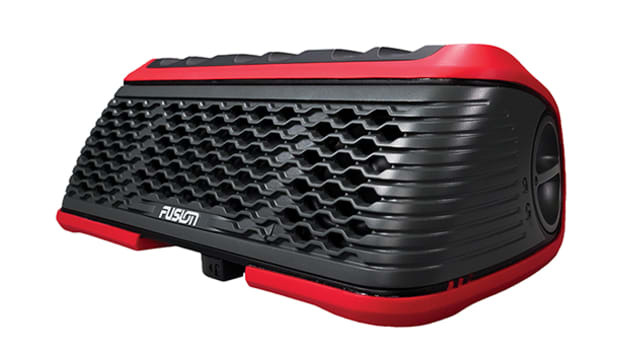 For instance, Fusion&apos;s four-, six-, and seven-inch two-way speakers feature titanium tweeters and heat-pressed polypropylene cones for both audio detail and marine endurance. Prices range from $70 to $130 a pair with a choice of three grill styles, and the $100, 25-watt AM100 zone amp is both compact and water-resistant. 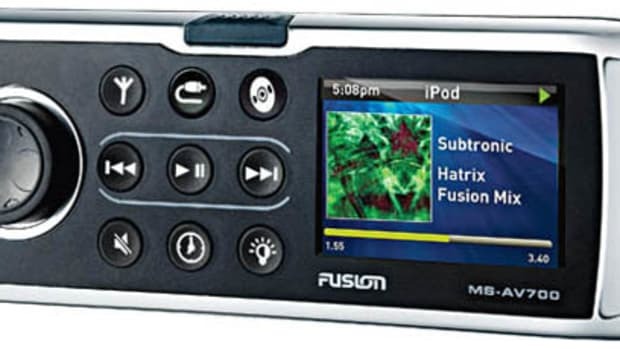 So how does Fusion sound? Excellent, though the normal speaker size and power generalities do apply. The four-inch two-ways sound quite clean and full versus similar-size speakers, but even better when powered by the zone amp instead of the head unit; the seven-inchers are better still. And nothing provides bottom like a good subwoofer properly powered—even the bass groove coming from a dinky iPod. It was interesting to compare the exact same speaker setups with the iPod first connected via its headphone jack and then via the digital connector built into its dock (which also charges it). The digital interface sounds much better, and the Fusion is quick at displaying playlist choices, tune titles, etc. In fact I recorded some of my tests and will post these clips on my blog in the hope that they can help folks compare different possible system layouts. 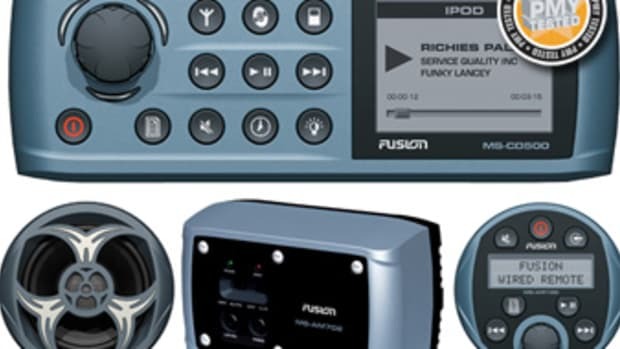 Installing a Fusion stereo is a feasible do-it-yourself project, with a major springtime audio payoff, but there are lots of possibilities to consider. For instance, you can put two zones in, say, the same main saloon and thus have fade control (like in your car). 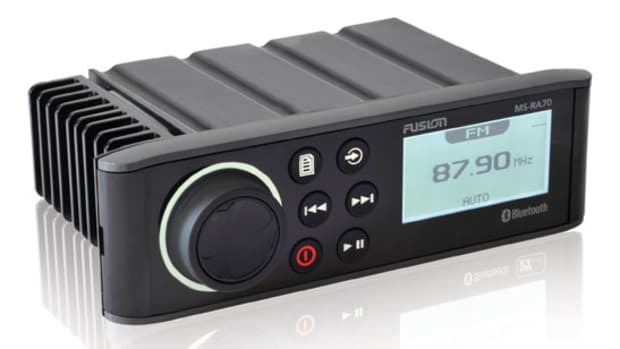 And Fusion also offers a CD-playing MS-CD500 head unit, with a separate iPod dock option, though I for one no longer see the need to lug the things onto a boat. Apple&apos;s iTunes computer software has gotten very good at recording CDs, and/or downloading music, podcasts, and audio books. 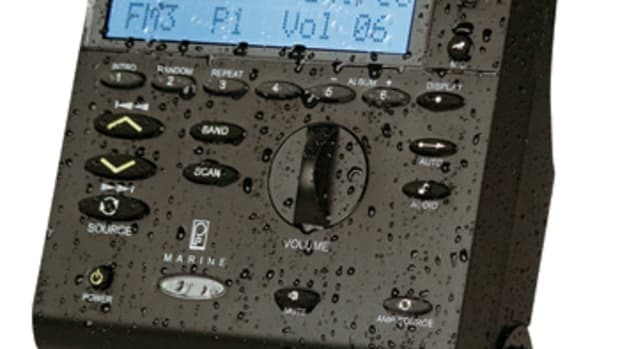 Note that on the larger yachts where regular home-audio products can safely abide, there are many iPod options. For instance, the skipper I profiled in November&apos;s "Early Adopter" column can see his iPod&apos;s files on a huge plasma screen and control it with his system-wide color touchscreen remote, and the audio is broadcast over FM to all the staterooms on his Azimut 55 and to neighbors who&apos;d care to tune in (details at my blog). 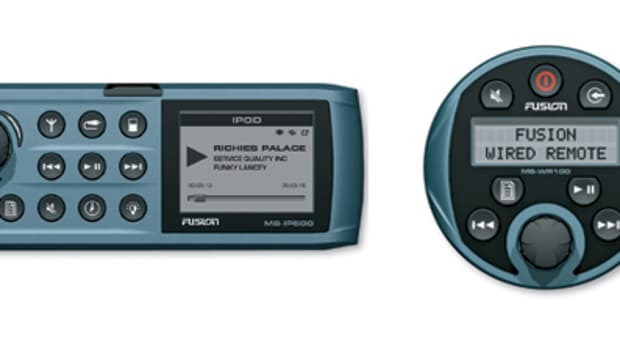 But no company I know of is doing iPod-centered audio for mid-size boats like Fusion, and few are even applying much innovation to boat audio (Poly-Planar being the exception that comes to mind). And Fusion isn&apos;t done. Just announced is the MS-AV300, which will play DVDs and have two video outputs—maybe one for your plotter and one for your TV—while retaining most of the features of the existing MS head units. 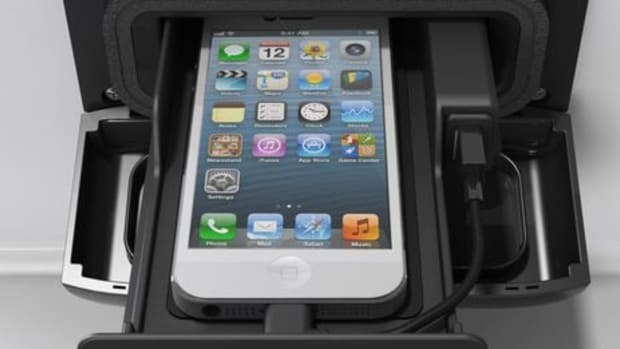 It will also support the separate iPod dock and hopefully—some "small engineering challenges" remain—will play the movies, TV shows, and video podcasts that you can easily download to an iPod these days. I gleefully watched The Daily Show on my Touch in an airport lounge recently, and I want that capability on my dreamboat, too. 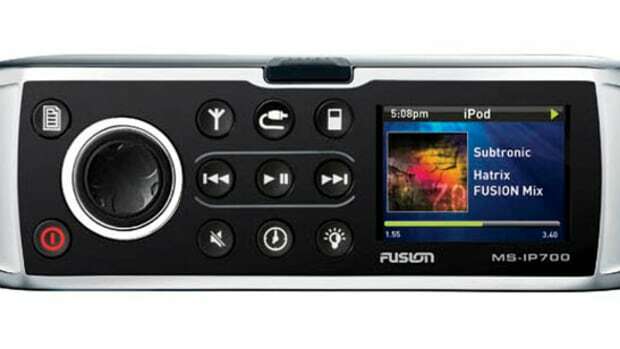 Fusion Marine Stereo 2013, great but confusing!